I had always heard great things about Rancho Naturalista but I didn't truly appreciate the property until I was there. As you read in my last post, the birding on property was fantastic but what I didn't mention is how comfortable the accommodations are or how incredible the food is! The staff and owners of the lodge made us feel at home and we enjoyed getting to know them during our stay. Although we had not really planned to use a guide from Rancho Naturalista while we were there, their guide Harry helped us out a lot. He is an extremely talented guide and is quite honestly one of the best I have worked with anywhere in the world. We were very lucky to have him with us during this portion of our trip. I surprisingly remembered to take a photo of my room before all of my birding gear exploded out of my bag! The rooms were very nice and comfortable. Everyone in the group agreed that we couldn't think of a better spot to spend a few days birding. Even though we were there during the "low" season, the birding was fantastic. 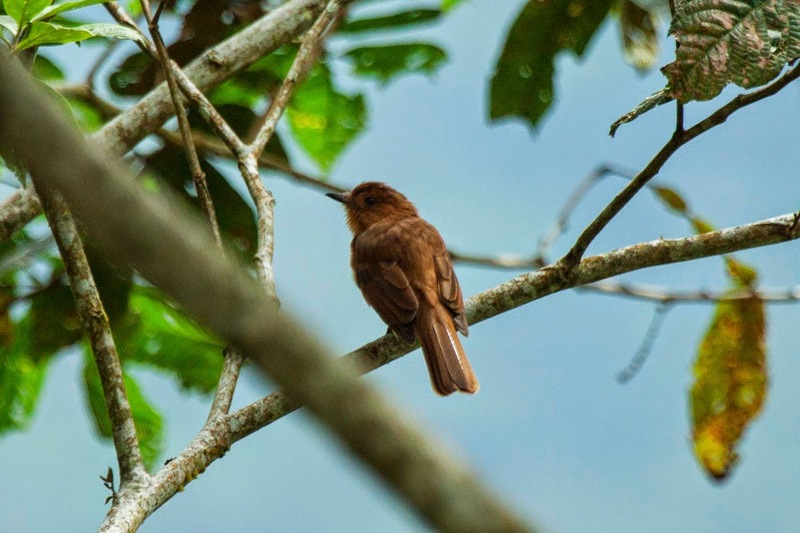 The only thing that is really different is that none of the neotropical migrants are around. 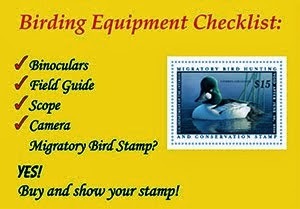 This pretty much means that the only birds you are missing out on are ones that occur in the United States anyway. We felt that the reduced amount of people on the property (for 2 of the 3 nights we were the only group there) really made our time there even more special. 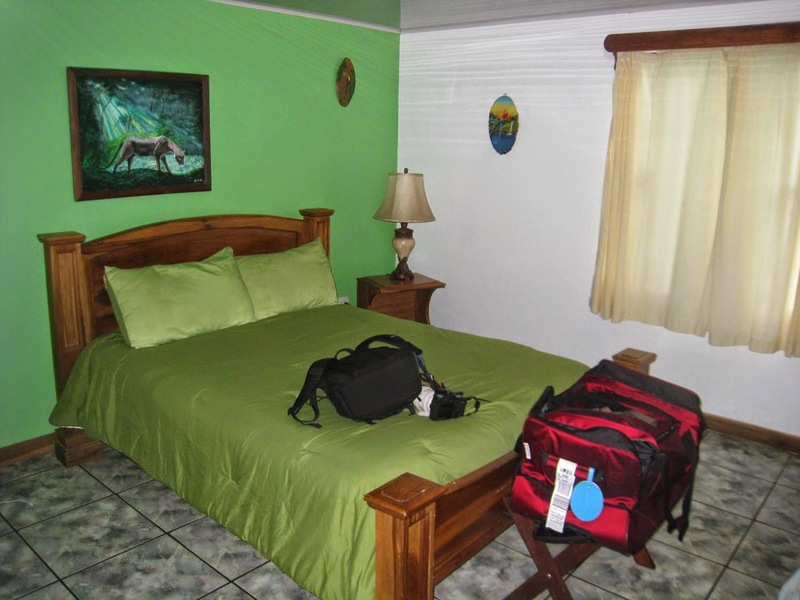 I highly encourage everyone to consider visiting this property on their next trip to Costa Rica! All that said, I should probably tell you all about our second day in the Rancho Naturalista area. After some brief morning birding and breakfast, we loaded into the van and headed a few minutes down the road to the La Mina area. We had one major target (Sunbittern) and plenty of other birds to look for as well. After some quality time spent watching Amazon Kingfishers, Torrent Tyranulets, and a Buff-rumped Warbler, we finally found a Sunbittern! Unfortunately, some of our group members were a little too short to see over the grasses and down to the river and the bird flew off before we could find a better spot to look from. 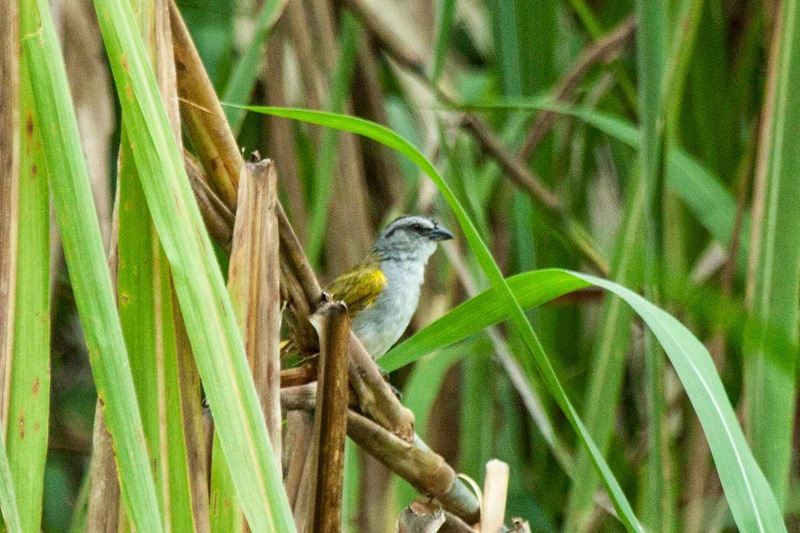 This Black-striped Sparrow paused just long enough for me to snap a photo of it along La Mina Road. 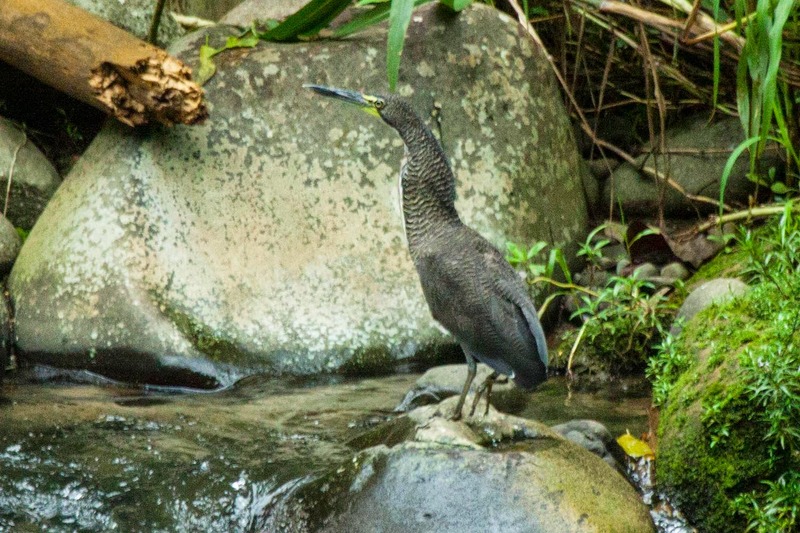 Fasciated Tiger-Herons love rocky rushing rivers and feel right at home in the La Mina area. Since not everyone had seen the bird, we decided to keep walking down the road and watching the river hoping to come across another one. We walked about 2 miles to where the road finally ended in the river or at least that is what we thought the road did. As we were standing there looking up and down the river, a pickup truck approached and proceeded to cross the river. I've never seen anyone cross such a fast moving and deep river, and there were several times that we were sure the truck would be swept away, never to be seen again. The driver finally made it across and continued on his way and we all stood there in shock! 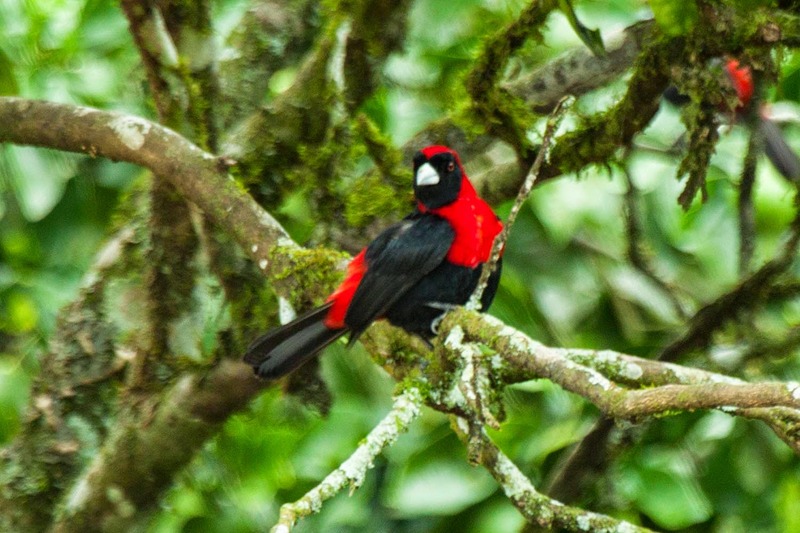 We found a few Crimson-collared Tanagers as we were driving out of the La Mina area. It is such a striking tanager and one of my favorites! We made our way back up to our parked van but never did see the Sunbittern again. After lunch at Rancho Naturalista, we decided to take it easy for the early afternoon hours. 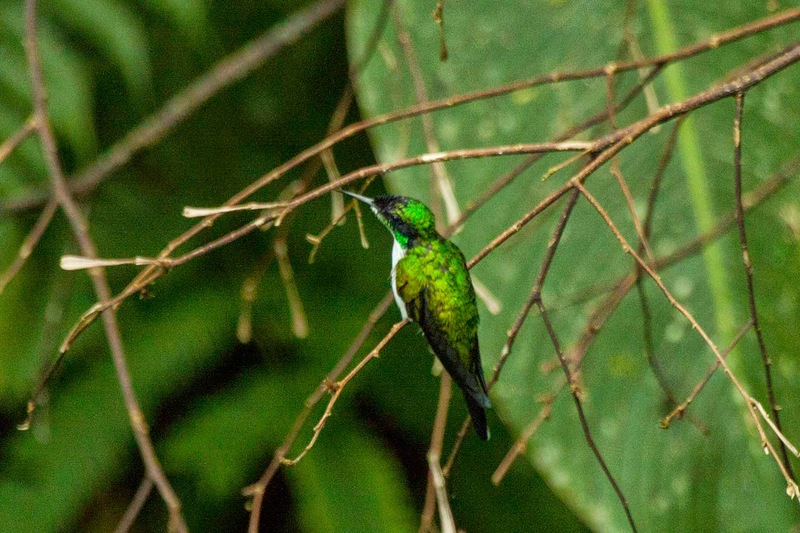 This gave me a chance to head down the road a bit from Rancho Naturalista and visit my friend Jill McDaniel who I met while birding in Honduras last year. Her and her husband have built a beautiful home less than a 5 minute walk from the lodge and are attracting some amazing birds to their feeders! We were very excited to see this Rufous Mourner near the feeding station at Rancho Naturalista! Our group decided to spend our final evening back at the hummingbird pools watching Snowcaps again. It was a wonderful couple hours. 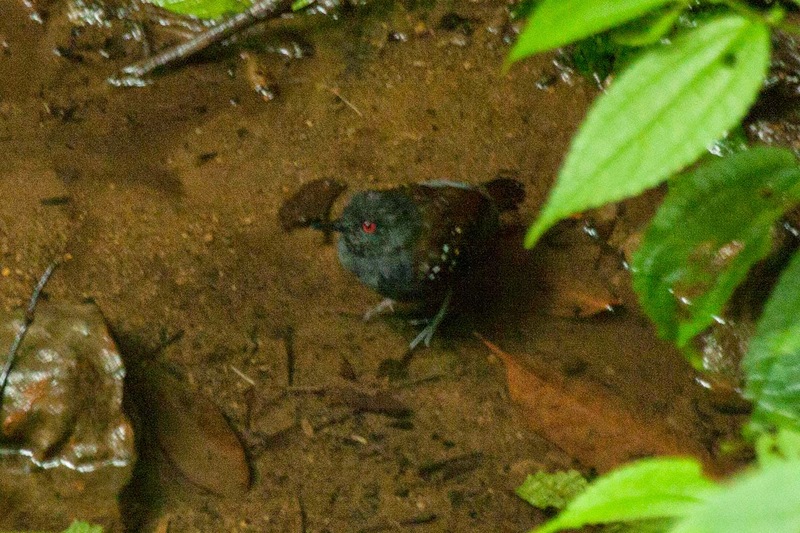 We got more great views of Snowcaps and greatly improved the views we had of Dull-mantled Antbird! 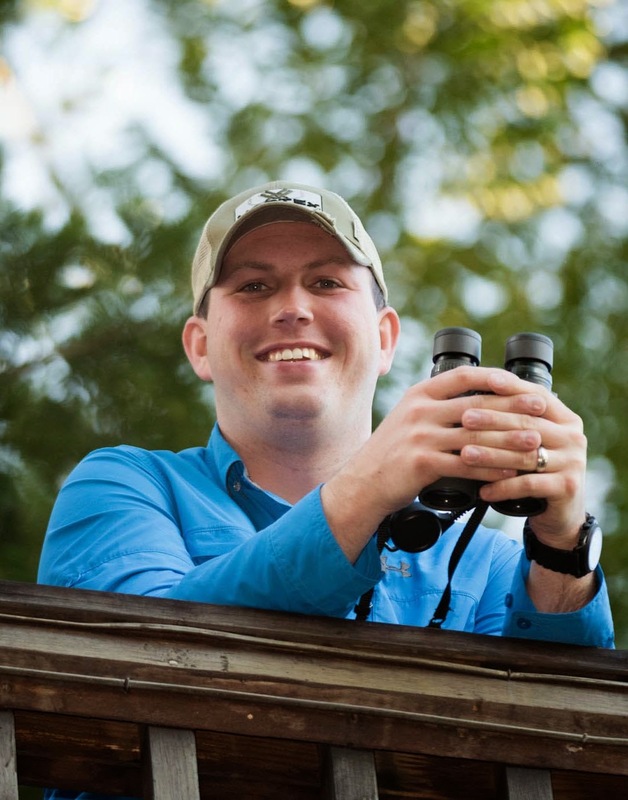 Rancho Naturalista is well known for getting birder their lifer Snowcap. It was getting dark when I took this photo but you can still tell what a beautiful bird it is. 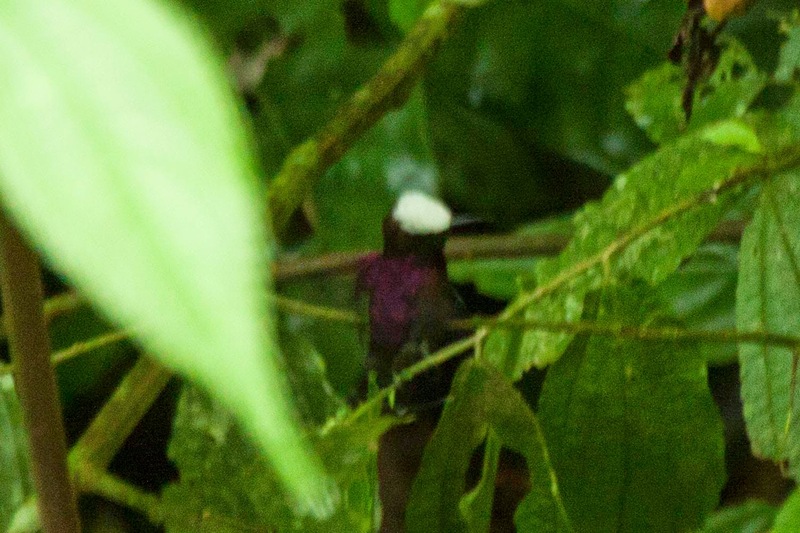 This Purple-crowned Fairy was a frequent visitor at the hummingbird pools. It was a long way down to the area where this Dull-mantled Antbird liked to hang out but I was still able to get a photo of it. We enjoyed our last dinner at Rancho Naturalista and spent a long time talking with Lisa who's family owns the property. Everyone was sad to be leaving in the morning but ready to start the next part of our adventure.